We cover the counties of Berkshire, Hampshire, Surrey, London & nationwide. 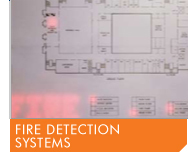 Under the Regulatory Reform (Fire Safety) Order 2005, every workplace is required to have adequate fire safety precautions (including fire alarm & detection systems) in place. Kingfisher can supply and install small conventional to fully networked analogue addressable systems, utilising multi criteria detectors. All our systems are designed to eliminate unwanted false activations. In the event of a fire, early extinguishing is essential to prevent the loss and damage of irreplaceable items such as servers holding critical business data, to priceless antiques and paintings. 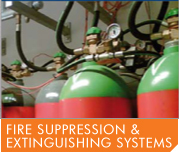 A fire suppression and extinguishing system linked to separate detection devices will stop a fire or limit the amount of damage caused, without the need for water and the further damaging effects it may have. 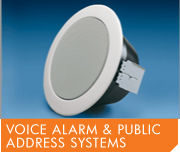 For larger sites or for buildings that are open to the public, voice alarms and public address systems are an efficient and effective way of capturing attention immediately and ensuring a safe and controlled evacuation from a building. 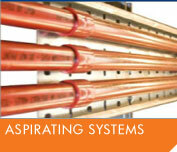 Aspirating systems are very versatile and can be used in a variety of different situations. For example, in high-ceilinged areas and closed voids where access for maintenance is an issue; in computersuites where the system can be set to a high level of sensitivity, and in high specification commercial and residential buildings where the visual appearance of the smoke detector is not desirable as air is sampled through a hole as small as 3mm.